The project site has a lot area of approximately 14,390 square feet, located on the northwest corner of Pinewood Avenue and Foothill Boulevard in the C2-1VL zone and a land use designation of General Commercial. The project site is currently operating as a 76 gas station. The site is developed with an approximately 1,150 square-foot food mart building, which is serving a four fueling pumping stations having an approximately 1,160 square foot of a canopy area. The height of the existing mini mart is at 13’-6”. 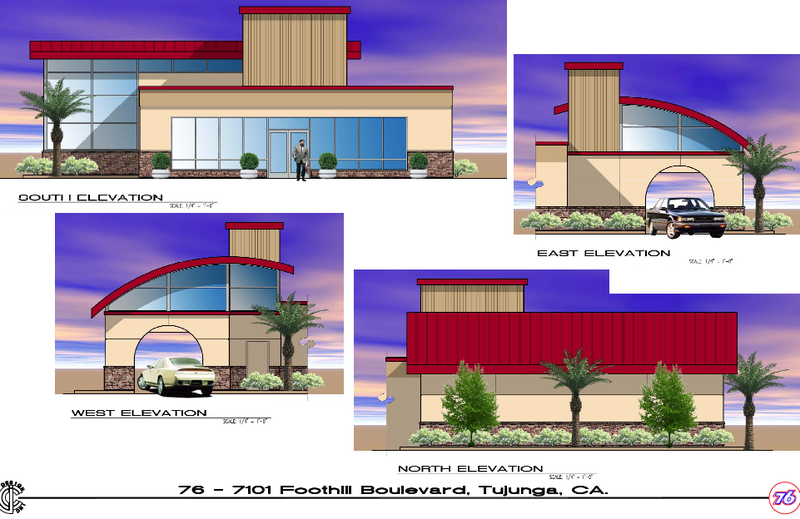 The project is proposing a new self-serve drive-thru car wash, approximately 1,012 square feet, attached to the existing food mart building on the northern portion of the property. The height of the new car wash building will be 25 feet at its highest portion. These two buildings will be attached by a new equipment room, which will serve the new car wash. The entrance and the exit to the new car wash tunnel will not face any residential uses, as the tunnel runs east-west and abutting uses on the east and west are all commercial. There is currently a 6-foot concrete block wall with landscaped buffer on the north portion of the lot where the site is abutting a residential use. The proposed tunnel will run parallel to the northern portion of the site. The site is providing a total of 18 parking spaces which include: 1 handicap, 3 compact, 6 regular, and 8 for fueling. In addition to the improvements that are being proposed with the car wash, the proposal at hand will also include a façade improvement, to upgrade the existing mini mart, which will be more consistent per the underlying citywide and Specific Plan design guidelines. The proposed aesthetic improvements will be consistent and compatible in scale, massing and height with the surrounding land uses and activities and provide an attractive design incorporating multiple vertical transparent windows that will provide a more desirable environment, both visually and functionally. The improvements will incorporate multiple elements into the design of the façade. Simple wall surfaces will be used such as stucco, stone veneer and fiber glass molding to break up the massing and make the façade more attractive. Also, earth tone colors will be used for the new building. The applicant is also proposing a new replacement sign pole to the existing legal pole sign located on the corner of Pinewood Avenue and Foothill Boulevard. The pole sign is an existing sign with proper permits. The applicant is proposing a total of 1,685 square foot of landscaping on site and intends to beautify the site with the new landscaping and overall aesthetic improvements. The intent of the existing site improvement is to better utilize the existing property. The improved site will not only be tremendously more attractive and appealing in design but it will also address the demand of the community for a better service location. Plans, rendering and photos for further review. 4-21-16 - Early Notification of this application. When the STNC receives the application packet, it will be posted. The Land Use Committee will be scheduling a presentation by the owner's representative in May or June 2016. The City will hold a public hearing before the Zoning Administrator prior to making a decision for approval or non-approval.